I don’t think I knew how vulnerable my last post was until I received some comments on Facebook and in real life about it. I knew that it was a bit hard to write, but I really feel like the Lord is calling me to a place a vulnerability and honesty. So here’s the thing: I need to make sure a few things are clear. Anything I write on my blog is never to intentionally hurt or put down others. This is simply a place where I write about what is working and going on inside of me. 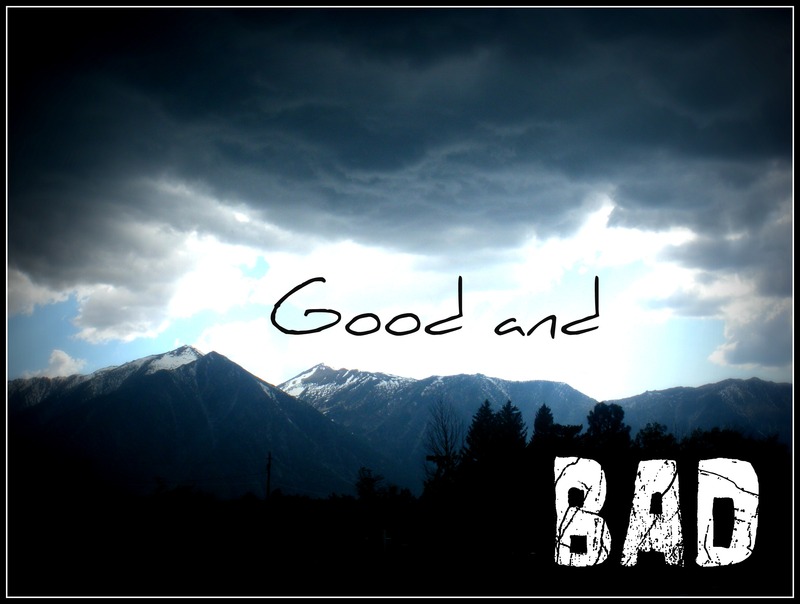 The good and the bad… and most of the time the bad that turns good. When I wrote about my life growing up, I had no intentions of making my family or friends look like jerks. They weren’t. I have a great family and I would not change anything about the way I was raised… it is what made me what I am today. I was not trying to make people “feel sorry” for the things I had to do. I was not looking for apologies from people- especially my family. My family was never the issue. My heart was… is the issue. but that’s not bad… it’s good. I prefer to know that God is with me, even if the whole world is against me. To this day it ranks among my favorite quotes, but you see, instead of allowing this quote to empower me to live for the Lord, I also allowed this quote to become my identity and my reason to turn hard toward others. in the midst of allowing me to become hardened outwardly, there was a growth that took place inwardly. Let me explain it to you a little more. I can specifically peg it to Summer Camp 1997. I was about to be entering into Junior High. I really wanted to fit in. I really wanted a group of cool friends who I could hang out with. I wanted to experience what other people were talking about… you know, the boys, the fun, the music, the… (honestly, I don’t even know anymore), but I wanted it. I also wanted to please my family. I grew up in church and at a very young age, I was a very committed “church girl,” but these two lifestyles were easily mutually exclusive. None of my church people were my friends outside of church, none of my school friends went to church… no problem. It was fun. I have a TON of memories of the fun times actually, but there was one speaker that I was stung by when he spoke. He spoke of something I didn’t have, and honestly had never really been confronted with in my life. Oh, I knew all about Jesus. I heard all the Bible stories over and over, but this I hadn’t heard. It was about a specific people. I people who were so committed to what they believed in that they were willing to die for it. Now, we’ve all heard of old noble guys who stood up for what they believed in… and we all applaud them with utmost respect, shaking our heads as we clap wondering where that passion comes from, but this was still different than that. I mean I loved hearing of Martin Luther King Junior dying in the midst of a crazy time- but truly having an impact of change in the world. That was cool, but again these stories were different. The people never were applauded. Actually, some were never even properly buried. They weren’t shot without a choice, but they were given an option to live. He told us of a 13 year old girl (hmmm… “I’m a 13 year old girl” I thought.) She lived in a country where the government and people in charge did not want her or anyone else to believe in Jesus. But, her and her family chose to believe in Him anyway. Then one day some people came and killed her family for their belief and they took her captive. They told this young girl that they didn’t want to hurt her, but if she denied that she believed in Jesus they would take her back to their own village and she could become part of their family. She could have a better life and they would take care of her. If she didn’t they would tie her to a tree to die. She wouldn’t deny her Jesus. At this point in the story, my mind had decided I would be a great hero. I would deny Jesus. But then ask Jesus to forgive me- surely He would, and secretly go back and “convert” people. That’s what I would do. Still heroic right? still ok- right? They tied her to a tree, covered her with honey, and left her there. She died. That was the end of the story. It didn’t make sense to me. Why wouldn’t she just deny and ask for forgiveness? Why? How could she just let them do that? Did she think they wouldn’t really do it? In that moment I knew I had had it all wrong. I had never chosen to live for Jesus. I knew all about Him. I could tell you his cousin, aunt, and uncle’s names, but I had never lived for Him. I knew that I was barely willing to die for Him and I knew that if I really wanted to live for Him- my life was going to have to change. After this, something happened to me. I became more weird. I specifically remember standing in front of the microwave one day watching the time count down for two whole minutes. By the end- my food was done, but I was disgusted by the fact that I had just wasted 2 whole minutes of my life. I better do more with my life then watch it count down! I knew that I wanted my life to be different. I wanted to live a life that made a difference. Soon this then spread to my thinking in many areas of life. I was incredibly blessed with many opportunities to travel on a few medical missions to Nicaragua in High School. This idea of wanting more from this life was even more instilled in me as I saw the power of God in some beautiful people. People who never got recognition, people who worked and served day and night and never seemed to tire, people who were truly living for Him. This was what I wanted, and not only did I want to live for Him… I wanted to die for Him as well. I would see it as such an amazing honor to be able to on with my final breath utter His name and in the next instant see His face. Even if no one knew I had died, even if my body wasn’t given a proper funeral. How amazing would it be to have lived and died for One who is so much more? This continues to be my heart today. This heart is what draws me so near to so many friends. I have many whose heart beats in rhythm with this desire. Not a desire to be a big speaker or writer or singer or even a preacher, teacher, doctor, or missionary, but a desire to live fully for Him with all I have and all I am. And then to die with the same meaning and purpose in which I lived. This is one of the reasons my heart still hugely mourns the loss of my now ex-fiancee… his heart beat with mine. All we desire to do is live for the Lord and yet somewhere this very desire is what has torn us apart. So even as there was a lot of bad about the hard rock that formed around me and my heart… please know… there was a lot of good that formed within as well. This entry was posted in living and tagged advice, christianity, depression, dying, future, God, growing, Hope, hopelessness, Jesus, learning, relationships. Bookmark the permalink.